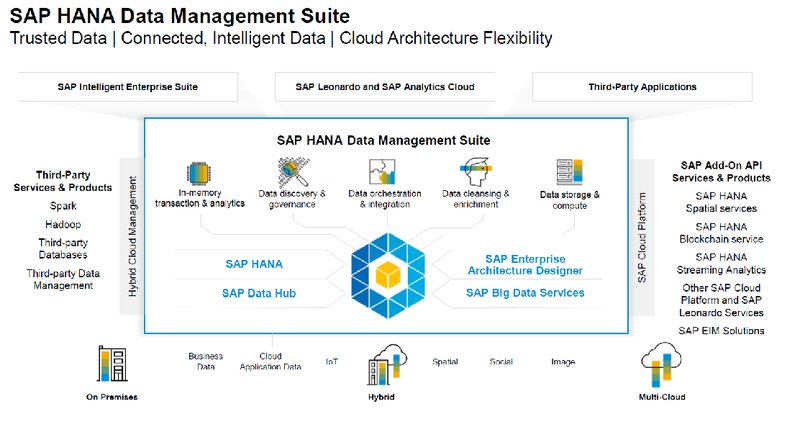 So let us talk more about the Datawarehouse, Datawarehouse is one of the 2 important use cases of SAP HANA for many customers, where the other use case being the SAP applications running on HANA like S/4 HANA, C/4 HANA, Hybris, SuccessFactors etc., which are more of transaction systems and getting embedded with machine learning, IoT and Advanced analytics capabilities in the recent past. SAP offers two Datawarehouse products to customers, Business Warehouse(BW) and SQL Datawarehouse. 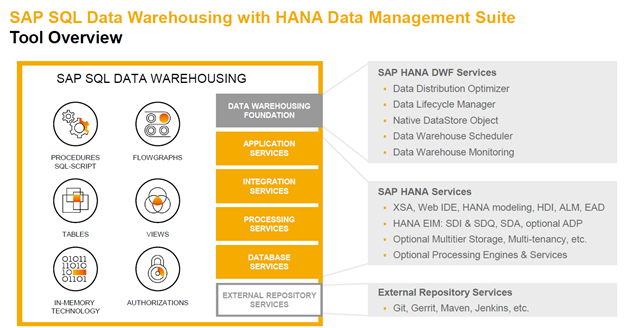 BW Warehouse has been SAP’s successful Datawarehouse application for many years and still getting lot of new innovations, it is a very good use case for accelerated template based developments for customers who use most of the Industry specific content available in ECC/S4 HANA/C4HANA etc., on the other side, SQL Warehouse is a best use case for Customized solution to handle complex data sets arriving in the new digital business. Of course, customers can choose mixed approach to get the benefits from both. As most of you know, HANA Native Application development is moved to run on XS advanced application server, XS classic has been deprecated in 2.0 SP 01. XSA is a container and services based object development, so all the database artifacts, applications are now being developed using micro services based architecture (Cloud foundry). It allows lots of flexibility to choose any programming language for server-side scripting etc., so understanding of XSA architecture is important to work on new SQL Datawarehouse, because several DW tools are introduced only on XSA compatibility. It is the new object development tool replacing the HANA Studio/Web workbench, to create the Multi Target applications for DB module and UI module object developments. It is fully integrated with Github for source code management. Database objects will be crated as CDS artifacts, data flows will be configured using SDI flowGraphs to transform the data to further layers. It is open source technology used to effectively control the source code versions while working in multi developer projects. It completely replaces the HANA repository which used to be the source control in HANA studio developments. So it is important to know the Github branching and controls like, PULL, PUSH, MERGE, CLONE and COMMIT etc., to work on the object developments. Creating and maintaining a complete landscape architecture that is easy to capture and understand visually. There is going to improvement with SAP industry-specific modelling content to accelerate the objects developments as Currently BW does. SDI Flowgraphs are used to transform the data and load into the several targets including NDSO, there are going to be task chains created to configure as workflow to run the flowgraphs in the required order. Provides several data management tools to support the SQL Datawarehouse use cases, one of the important objects is Native Data Store object, which is exactly same as BW ADSO features. It can be used to replicate the BW use cases of data processing. The other tools like DDO, Scheduler and monitoring are used for better administration purposes. All the HANA platform capabilities of Text analysis, Graph, Spatial and predictive analytical features are available for advanced analytics. It manages the entire data flow(Pipe) control from one source to other, complete Orchestration of Data is possible with this tool. With all the above tool set, Data management suite is going to evolve as strong platform for SQL Datawarehouse use cases for customized dataset processing and analytics requirements.